Geomorphometry of headwater catchments has been poorly reported in the Central-Eastern Pyrenees. 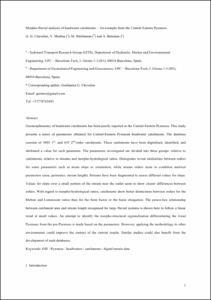 This study presents a series of parameters obtained for Central-Eastern Pyrenean headwater catchments. The database consists of 3,005 first-and 655 second-order catchments. These catchments have been digitalised, identified, and attributed a value for each parameter. The parameters investigated are divided into three groups: relative to catchments, relative to streams and morpho-hydrological ratios. Histograms reveal similarities between orders for some parameters such as mean slope or orientation, while stream orders seem to condition metrical parameters (area, perimeter, stream length). Streams have been fragmented to assess different values for slope. Values for slope over a small portion of the stream near the outlet seem to show clearer differences between orders. With regard to morpho-hydrological ratios, catchments show better distinctions between orders for the Melton and Lemniscate ratios than for the form factor or the basin elongation. The power-law relationship between catchment area and stream length recognised for large fluvial systems is shown here to follow a linear trend at small values. An attempt to identify the morpho-structural regionalisation differentiating the Axial Pyrenees from the pre-Pyrenees is made based on the parameters. However, applying the methodology to other environments could improve the context of the current results. Similar studies could also benefit from the development of such databases. Chevalier, G., De Medina, V., Hurlimann, M., Bateman, A. Morpho-fluvial analysis of headwater catchments: an example from the Central-Eastern Pyrenees. "Enviromental earth sciences", Maig 2015, vol. 73, núm. 10, p. 6495-6509.